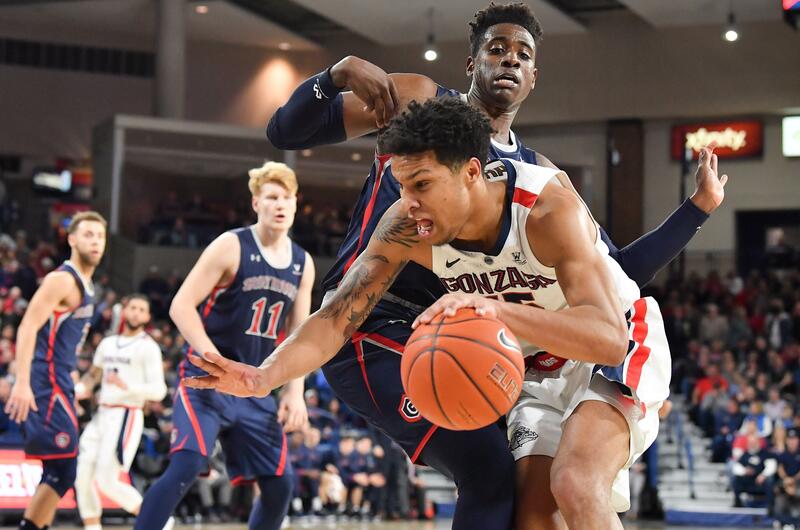 Mon., Feb. 11, 2019, 10:31 a.m.
Gonzaga’s Brandon Clarke, who averaged 22 points, 11 rebounds and four blocks in two blowout wins, has been named the WCC player of the week. Clarke made 17 of 25 field-goal attempts in victories over San Francisco and Saint Mary’s. His 16 rebounds against USF set a McCarthey Athletic Center record. The 6-foot-8 junior forward broke the school record for single-season blocks. He had five against the Dons and three versus Saint Mary’s to give him 77 for the season, surpassing Austin Daye’s 70. Clarke ranks third nationally. Clarke, in just 25 games, is three blocks from tying Mark Spink’s 80, which ranks 10th in program history. Clarke is ninth on the WCC single-season list, 15 away from cracking the top five. Clarke is shooting 68.8 percent from the field. Former Zag Domantas Sabonis holds the WCC record at 66.8 percent in 2015. Clarke’s shooting percentage leads the nation. Duke’s Zion Williamson is second at 68.2 percent. Published: Feb. 11, 2019, 10:31 a.m.